To determine whether the H63D and C282Y mutations in HFE (hemochromatosis) gene are associated with the risk of gestational diabetes mellitus (GDM), we conducted the study of 65 incident cases. The class of gestational diabetes (A1, A2, B) in pregnant women was defined based on the results of glycemic profile and 75-g oral glucose tolerance test. Two single nucleotide polymorphisms (H63D and C282Y) in HFE gene were genotyped by PCR and RFLP (Restriction Fragment Length Polymorphism). The frequencies of mutations in patients cohort were: 0.14 for H63D and 0.02 for C282Y, which are similar to the data reported for Belarusian population (0.16 and 0.04 respectively). The detailed analysis of case subjects indicated association of H63D mutation with the severity of gestational diabetes mellitus. In the frequencies of H63D mutation and genotypes between the case subjects with A1 and B gestational diabetes were detected significant differences. Our data indicated that the presence of H63D mutation in pregnant women with GDM aggravates the disease—odds ratio 7.4 (95% CI 1.8 - 30.5). Women with gestational diabetes have severe increased risk for illness progressing to class B if they are H63D mutation carriers. Gestational diabetes mellitus (GDM) is a form of glucose intolerance diagnosed during pregnancy. According to the American Diabetes Association, about 4% of pregnant women suffer from GDM. It is 100 times more frequent than cases of pregnancy with type 1 or type 2 diabetes mellitus [1,2]. There are several risk factors for the development of GDM, the main are considered glycolsuria, ketonuria, obesity, diabetes mellitus in 1st degree relatives [3,4]. But these are not enough to confirm or exclude the chance of GDM manifestation, predict the severity of abnormal carbohydrate metabolism during the gestation or the risk of diabetes mellitus development after childbirth. The role of genotype should be considered as one of the leading reasons of GDM. Number of human genes was investigated dealing with GDM: HLA, SUR1 (sufonylurea receptor gene), GCK (glucokinase gene), TCF7L2 (transcription factor 7-like 2 gene), HFE (hemochromatosis gene) and others with contradicting results [5-10]. Several articles about correlation between HFE gene mutations and abnormal carbohydrate metabolism were published in recent years [10-12]. The gene is located at 6p21.3 and encodes a protein necessary for iron transport into cells. In 1996 Feder et al. described two missence mutations in HFE gene—С282Y and H63D. They are associated with increased iron absorption and progressively deposition in the pancreas, heart, liver, joints and others tissues . In the last decade, the attention was focused on the study of the iron role in the abnormal carbohydrate metabolism [14,15]. This is particularly important with regard to the GDM, because there is no physiological blood loss during pregnancy, so excess iron cannot be removed from the body in this period. Moreover, for the anemia prevention iron supplementation are recommended for pregnant women, as a result increases risk of iron overload in subjects with С282Y and H63D genotype. The aim of this study was to evaluate the association between С282Y and H63D mutations and the risk of gestational diabetes mellitus in Belarusian pregnant women. The case subjects reported in the study are pregnant women suffering from GDM. They were attending the Pregnancy Pathology Department of the 1st City Clinical Hospital (Minsk, Belarus) and National Research Center “Mother and Child” (Minsk, Belarus) between January 2007 and December 2009. Written informed consent about voluntary participation in the study was obtained from the all case subjects. The study has been considered and approved specifically by the Bioethics Committee of the Belarusian State Medical University (Minsk, Belarus) and the Scientific Board of the Institute of Genetics and Cytology of the National Academy of Sciences (Minsk, Belarus). The case cohort consisted of 65 Belarusian pregnant women with GDM diagnosed according to the National Diabetes Data Criteria . The class of gestational diabetes (A1, A2, B1 and B2) in pregnant women was defined based on the results of glycemic profile and 75-g oral glucose tolerance test between 24 and 32 weeks of gestation. Criteria of GDM classification are detailed in the Table 1. The 736 healthy Belarusian inhabitants (age: 24.9 ± 4.5) were recruited in large screening study conducted in the Institute of Genetics and Cytology of the National Academy of Sciences (Minsk, Belarus) between January 2005 and May 2006 . Table 1. 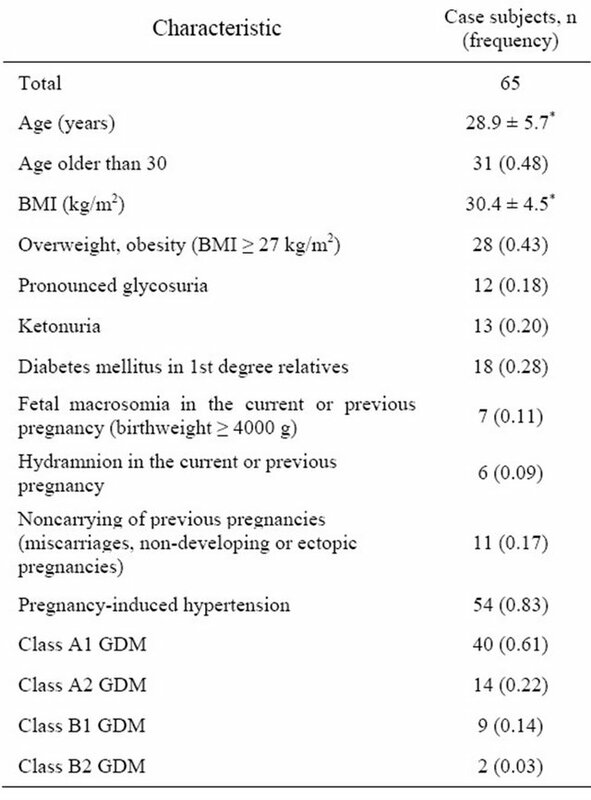 Classification of gestational diabetes mellitus adapted to Belarusian pregnant women. when urine glucose level was >6.7 mmol/l, ketonuria—urine ketone bodies level ≥ 5.0 mmol/l. Criteria of pregnancy-induced hypertension were: edema, proteinuria, vasospasms of the arteries (sustained blood pressure elevation of 140/90 or more). For the case cohort study 50 - 100 mcl (1 - 2 drops) of peripheral blood was collected between 33 and 38 weeks of pregnancy. DNA was isolated with proteinase K and phenol-chloroform purification . Two single nucleotide polymorphisms (H63D and C282Y) in HFE gene were genotyped by PCR and RFLP (Restriction Fragment Length Polymorphism). The polymorphisms were amplified separately in 15 mcl of a reaction mixture containing 5 - 10 ng of genomic DNA, 2 mcl of 10× amplification buffer solution (“Fermentas”, Lithuania), 1.5 mM MgCl2, 200 mcM of each deoxynucleotide triphosphate (dNTP), 2.5 U of Taq DNA polymerase (Fermentas, Lithuania), and 0.3 mcM of each primer. A MyCyclerTM thermal cycler (BIORAD) was used for PCR. Conditions for successful genotyping H63D and C282Y are presented in Table 3, where primers, annealing temperature, endonucleases (“Fermentas”, Lithuania) are indicated. Table 2. Characteristic of the case subjects. *Indicates mean ± standard deviation. Table 3. Primers, PCR conditions and endonucleases for genotyping. Visualization of restriction fragments was performed in 8% and 5% polyacrylamide gel for H63D and C282Y respectively. The χ2 test was used to compare the frequencies of alleles and genotypes. For small cohort comparing the Fisher’s Exact Test (FET) was applied. Genotype frequencies were tested for Hardy-Weinberg equilibrium. An odds ratio (OR) and 95% CI were calculated as described . The allele frequencies were 0.14 for H63D and 0.02 for C282Y as presented in the Table 4. We did not find C282Y homozygotes and compound heterozygotes in the case subjects. Observed genotype frequencies are consistent with Hardy-Weinberg equilibrium: χ2 0.04, P 0.85 for C282Y and χ2 0.07, P 0.80 for H63D polymorphism. 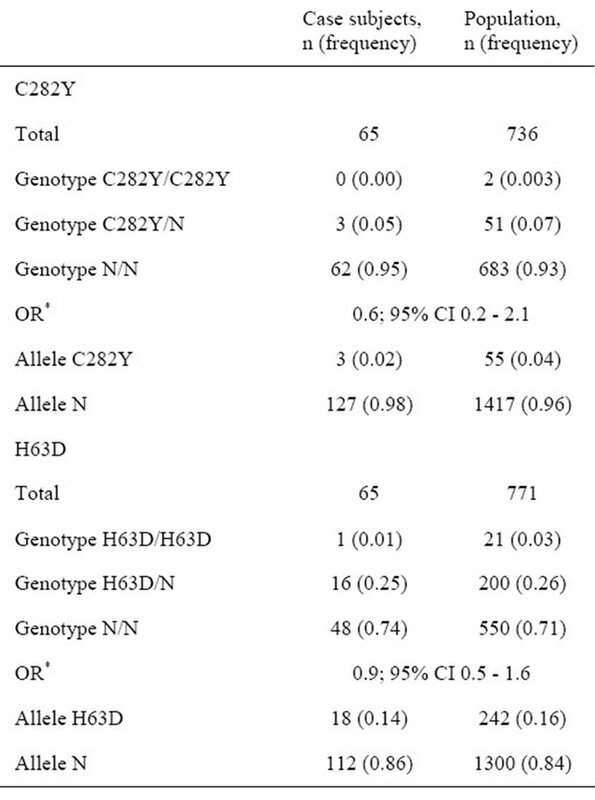 To determine whether these mutations could be a risk factor for the development of gestational diabetes mellitus, the prevalence of H63D and C282Y in case subjects was compared to that of the population rate (Table 4). There were no significant differences in genotype and allele rates of H63D (χ2 0.3, P 0.58) and C282Y (FET, P 0.62). The average frequencies of HFE mutations and genotypes in Belarusian population were in HardyWeinberg equilibrium (P > 0.05) . According to the odds ratio index, C282Y (OR 0.6; 95% CI 0.2 - 2.1; P 0.60) and H63D (OR 0.9; 95% CI 0.5 - 1.6; P 0.77) are probably not associated with the GDM risk in Belarusian women. To study whether the H63D and C282Y mutations in HFE gene are associated with the severity of GDM, we compared the different classes of the disease. The largest group was A1 class (40 persons), the next one—A2 class (14 persons). Pregnant women with B1 and B2 GDM were combined in one group B because of small sample size. Table 4. C282Y and H63D frequencies in case subjects and Belarusian population. *OR refers to the association of alleles with GDM risk. 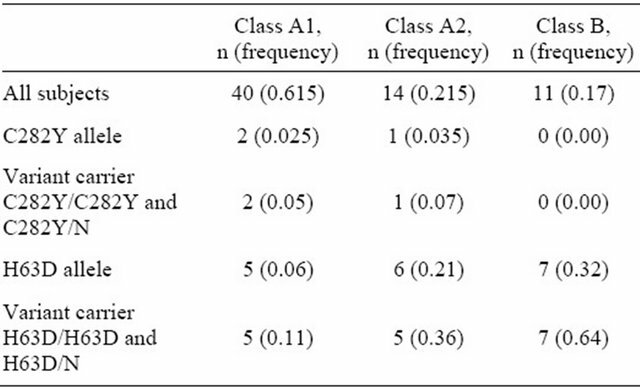 observed that H63D mutation is associated with approximately 7-fold increase in the risk of having class B GDM, which is treated by insulin (OR 7.4, 95% CI 1.8 - 30.5). Table 5. C282Y and H63D mutations in case subjects with different classes GDM. intake in relation to the risk of type 2 diabetes . The results of our study indicate that H63D and C282Y mutations do not provoke the gestational diabetes. But H63D genotype can enhance GDM manifestation, because the abnormal iron metabolism affects on the glucose and insulin homeostasis of the body. It means the use of insulin in diabetes therapy for correction carbohydrate metabolism in women with B1 and B2 classes in comparison with A1. It should be noted that two subjects with B2 GDM that participated in this study were H63D heterozygotes. 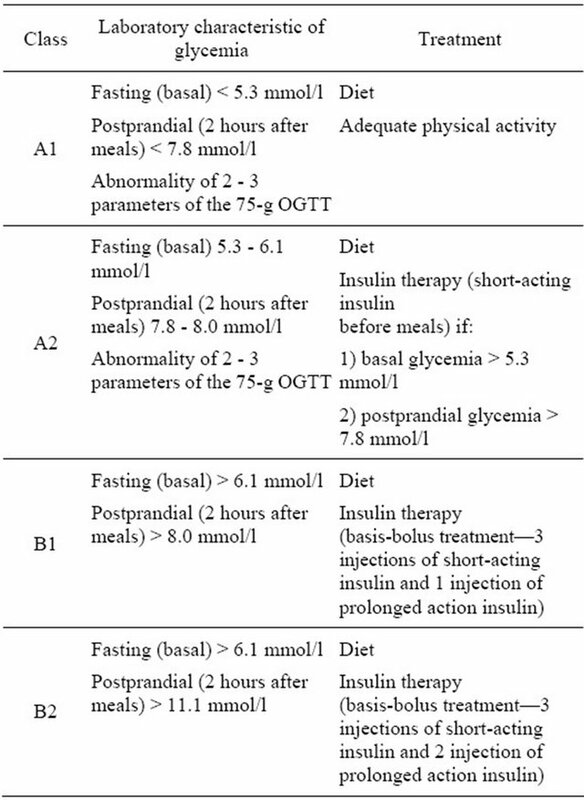 Insulin in high doses was used for their treatment to achieve the adequate glucose level. Abnormal iron metabolism may lead to excessive iron accumulation during the pregnancy, because there is no physiological blood loss in this period. Iron overload impedes the insulin extraction in the liver, so it causes the development of peripheral hyperinsulinemia . Iron accumulation in β-cells of the pancreas significantly reduces insulin secretion . Free radicals synthesized in reactions with iron injure cells [23,24]. Severe damage of renal, vessel, heart muscle tissues can speed up the complication development in people with diabetes, including the GDM. We suppose that iron supplementation during pregnancy should be corrected depending on the H63D genotype in women with GDM. If H63D leads to aggravation of the GDM, it is quite probable that women with this mutation will suffer from sugar diabetes later in their life. The iron intake may prevent the normalization of carbohydrate metabolism in the body after GDM. Immediately after pregnancy, 5% - 10% of patients with gestational diabetes are found to have diabetes, primarily type 2. Women with GDM have 40% - 60% chance of developing diabetes in the next 5 - 10 years . Dorner et al. showed increased familial aggregation of diabetes on the maternal side of descendants with type 1 diabetes whose mothers had GDM . Also Damm indicated that offspring after GDM pregnancies have an 8-fold risk of diabetes or prediabetes at the age of 19 - 27 . The possible link between HFE mutations and risk of diabetes mellitus manifestation after GDM requires thorough long-term researches. In summary, we discovered the association between H63D genotype and the severity of GDM in Belarusian patients. Our data indicated that H63D mutation is associated with approximately 7-fold increase in the risk of having class B GDM, which is treated by insulin. Z. V. Zabarouskaya, O. V. Muliarchik and T. A. Gdanova, “The Gestational Diabetes Mellitus Problems: The Main Aspects of the Pathogenesis, Clinical-Diagnostic Criteria, Principles of Treatments,” Medicinskie Novosti, No. 12, 2002, pp. 12-19. M. Hod, “Textbook of Diabetes and Pregnancy,” 1st Edition, Martin Dunitz, London & New York, 2003. P. Moleda, A. Binczak-Kuleta, K. Homa, K. Safranow, Z. Celewicz, A. Syrenicz, A. Stefanski, A. Fronczyk and L. Majikowska, “The Common C49620T Polymorphism in the Sulfonylurea Receptor Gene SUR (ABCC8) in Patients with Gestational Diabetes and Subsequent Glucose Metabolism Abnormalities,” Experimental Diabetes Researches, Published Online, 2012. J. M. Fernandes-Real, А. Lopes-Bermejo and W. Ricard, “Cross-Talk between Iron Metabolism and Diabetes,” Diabetes, Vol. 51, No. 8, 2002, pp. 2348-2354. O. V. Muliarchik and Z. V. Zabarouskaya, “Diagnostic Features of Gestational Diabetes Mellitus and Treatment during Pregnancy,” Belarusian Medical Journal, No. 2, 2002, pp. 41-42. L. N. Sivitskaya and A. I. Kushniarevich, “Hereditary Haemochromatosis: С282Y and H63D Mutations Frequencies of HFE Gene in Belarus Population,” Proceedings of the National Academy of Sciences of Belarus, Vol. 6, No 1, 2007, pp. 414-418. C. C. Mathew, “The Isolation of High Molecular Weight Eucaryotic DNA,” In: J. M. Walker, Ed., Methods in Molecular Biology, Human Press, Clifton, 1984, pp. 31-34. P. N. Babich, A. V. Chubenko and S. N. Lapach, “Application of Modern Statistical Methods in Clinical Trials. Part 3. Odds Ratio: Concept, Computation and Interpretation,” Ukrainian Medical Journal, Vol. 46, No. 2, 2004, pp. 138-144. D. K. Moczulski, W. Grzeszczak and В. Gawlik, “Role of Hemochromatosis C282Y and H63D Mutations in HFE Gene in Development of Type 2 Diabetes and Diabetic Nephropathy,” Diabetes Care, Vol. 24, No. 7, 2001, pp. 1187-1191. S. V. Mikhailova, O. V. Onopchenko, А. V. Sukhanov, V. N. Maksimov, Т. К. Gaskina, А. G. Romaschenko and М. I. Voevoda, “Haplotypic Analysis for the HFE Gene in Russian Populations and in Patients with Common Deseases,” Vestnik Vogis, Vol. 10. No. 3, 2006, pp. 504-513. Т. Т. Lao, P. L. Chan and K. F. Tam, “Gestational Diabetes Mellitus in the Last Trimester—A Feature of Maternal Iron Excess,” Diabetic Medicine, Vol. 18, No. 3, 2001, pp. 218-223. P. Damm, “Future Risk of Diabetes in Mother and Child after Gestational Diabetes Mellitus,” International Journal of Gynecology and Obstetrics, Vol. 104, Suppl. 1, 2009, pp. S25-S26.